Edited by AeonsLegend, 20 March 2019 - 07:50 AM. Let's try and not re-enact some Gamergate garbage over a concerning story that has a decent chance of being BS anyway. Why are you people getting so wound up when there's really very little evidence so far? Looks like pcgamesn tweet is gone, they are trashy click-bait writers who often don't know what they are talking about, their twiiter account has barely any traction. Hopefully Obsidian see the good sense in not talking Epic's money, the backlash is not worth it. Fortnite kids are not going to buy into a game like The Outer Worlds, few are going to leave Steam and sign up to Epic's outlet. This would be an easy story for the publisher to confirm/deny, but nobody has. It's one of those things that's only blown up because of silence on the part of the people who can answer the question. Well, and because there has been a lot of internet controversy about the Epic launcher being really blatant spyware, and games like Metro Exodus and Phoenix Point going Epic exclusive out of nowhere after advertising Steam access. Edited by sean10mm, 20 March 2019 - 07:59 AM. Oh, look. Another slacktivist who believes he's changing the world, one furious post at a time. Have you punched your daily nazi yet? Everyone knows it's best to be an early access male. This thread is going to places. 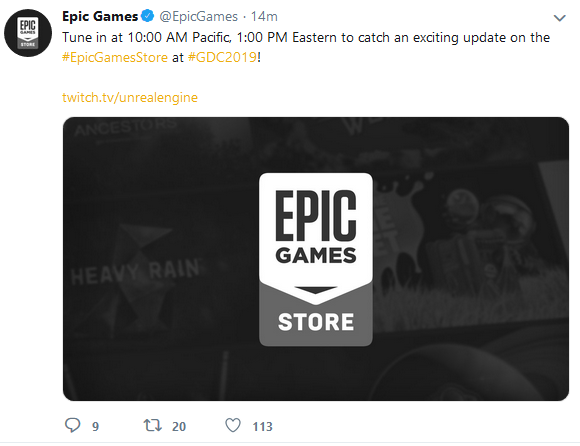 Epic Game store is the most awful platform out there, way worse comparing to any of its competitior, whether it's Uplay or Origin. The worst part is they are not trying to make their platform better, they are just trying to buy exclusive to force people use it, meanwhile bluffing about "helping" the developer. And on top of it being ****, I can't even buy a game from it just because I live in China. If Outer Worlds go there for the money I won't touch this game even when it comes back to steam a year later. Seriously, **** Epic Game store, the soon it rots in hell the better. It's going to epic games allright. It... SHOULD go to Epic Games? It just shouldn't go JUST to Epic Games. The game (all games) should be in all the storefronts. Obsidian, today you lost a sale, a loyal customer and a longtime fan. Edited by Infinitron, 20 March 2019 - 09:27 AM. Well this blows, I was looking forward to this, but no sale for if it is exclusive.